What if everything you touched turned gold? Now is your chance to make that happen in the 5-reel, 4-row, 40-payline Goldify slot machine by IGT. 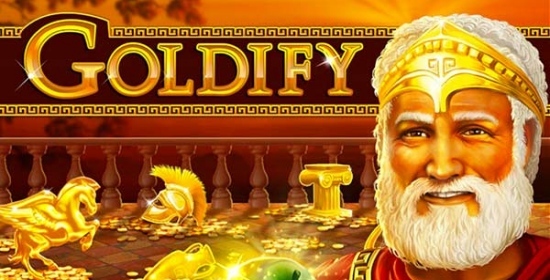 Join King Midas on a slots adventure with a unique feature that changes symbols to gold and pays 5x their normal value! With a payout of 96.20% and rich features, you can show the world that you have the Midas touch.In a predictably bold colour choice, this game is painted in rich gold and orange hues. The symbols are photorealistic versions of the characters from the story of King Midas and include him and his daughter whom he accidentally changes to a gold statue! That`s not a big deal for you though because everything you turn to gold will result in bigger winnings. Spin the reels of this game and win with Wilds, x5 Multipliers on Goldified symbols, and up to 500 free spins!King Midas Wilds King Midas is the game`s wild symbol and top paying symbol in the game. He can substitute for all symbols except the free spins scatter trigger.Goldified Symbols Goldify symbols directly on the reels or press the “Goldify” button to change symbols to gold and earn 5x their normal value.Free Spins Scatter The Golden Rose is the scatter symbol responsible for awarding free spins. Landing 3, 4 or 5 anywhere on the reels will win you 15, 50 or 100 free spins with between 3 and 5 goldified symbols added to the reels. Free Spins can be re-triggered up to a maximum of 500 spins. SkyVegas casino - £10 Free Bonus + 200% Bonus up to £1,000 Free. Caspers Mystery Mirror - Classic 40 Line Slot from Blueprint Gaming. 40 Shining Jewels - Classic 40 Line Slot from Casino Technology. Duck of Luck - Free Spins 40 Line Slot from Casino Technology. Spinning For Gold - Free Spins 9 Line Slot Machine. Vikingmania - New Bonus Feature 20 Line Slot Machine. Goddess Of Life - New Bonus Feature 20 Line Slot Machine.